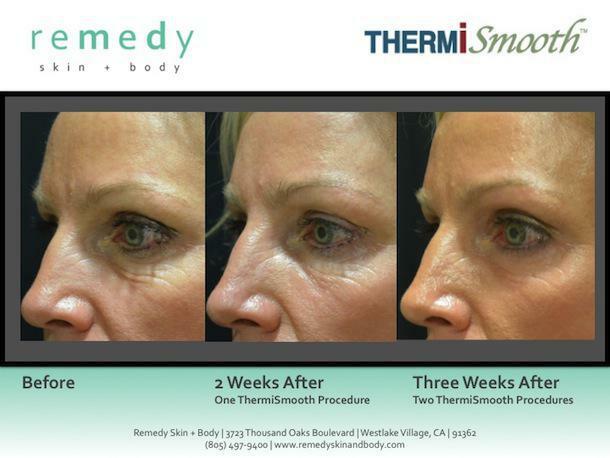 ThermiSmooth Face is a non-invasive way to lift and smooth skin of the face without any pain or downtime. Although treatments can be done for the entire face, the application is ideal for the fine skin around the eyes and lips. ThermiSmooth’s cutting-edge technology has built in temperature control which allows your Remedy practitioner to precisely regulate the amount of energy delivered to the skin. Why does this matter so much? With precision, we can give each patient the perfect treatment for their particular skin to get the most effective results while remaining completely safe. In almost all cases, patients who undergo the ThermiSmooth Face procedure need no recovery time—you can simply get back to your day. In rare cases minor swelling and redness may occur. The ThermiSmooth Face procedure is usually very quick. Most sessions last about 30 minutes. Treatments are gentle, with patients often comparing it to the feel of a hot stone massage. 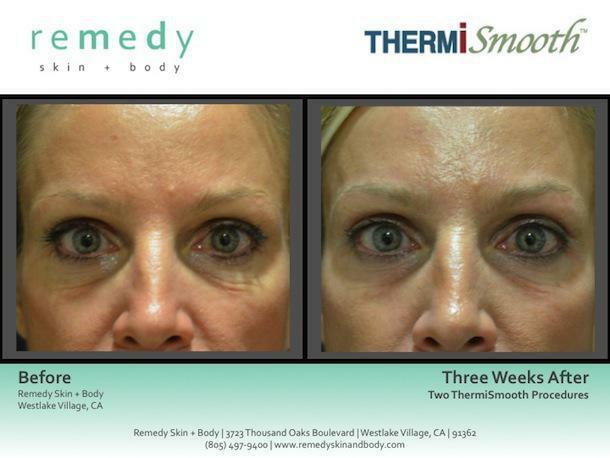 Most patients begin to see benefits from ThermiSmooth Face after the first treatment, and typically 3 treatments are necessary to achieve optimal results. Production and strengthening of collagen in the skin, called collagenesis, is a gradual process, so smoothing and tightening changes become more apparent as time goes on, with full results achieved after 3-6 months and lasting one year or longer. Single maintenance treatments are recommended every 9-12 months.